North River Fly Guys: First Post and First Fish of the Year! First Post and First Fish of the Year! Hello All, my name is Ashu Rao and I am a junior at UNH. I started fly fishing 4 years ago and it has become my favorite pastime. Whatever time not spent studying in school, working, or hanging out with friends, I spend on the river, constantly practicing my technique. Most of my fishing is done in southern NH and northern MA, although every now and again, I may stray out to the Berkshires or the North Country. I created this blog to record some of my fishing adventures and also share my thoughts on certain techniques, flies, and fishing spots. The posts may come slowly at first but once the season kicks into full swing, I will start to post more about my adventures and thoughts about various techniques that I'm using as well as my take on local fishing spots. I went out on Wednesday (March 8) and fished a couple of local freestones before work. The first stop I made is only a couple minutes away from school. The water was high and cold, despite the fact that it had fallen over 1000 cfs over the span of one week. I fished for probably about an hour without any hits in all my usual deep and slow spots. Instead of fishing on, I decided to skip and head to another spot. Unlike Spot A, Spot B was fairly crowded. There were about 3 fisherman in the first pool from the road but I decided to walk further to avoid the crowds. The water in this spot was much lower but still just as frigid. I started out at the bottom of a long run below the pool and I worked my way up to the head without registering any bites. Instead of going up to the large pool near the parking lot, I decided to walk down even further to another nice pool. This pool was fairly shallow except for one deep divot between two more turbulent currents. It was the perfect scenario where fish could sit in the calm water to rest and move closer to both turbulent currents when they wanted to feed. I immediately started to cast towards the closer seam but after logging no bites, I started to fish the far seam. 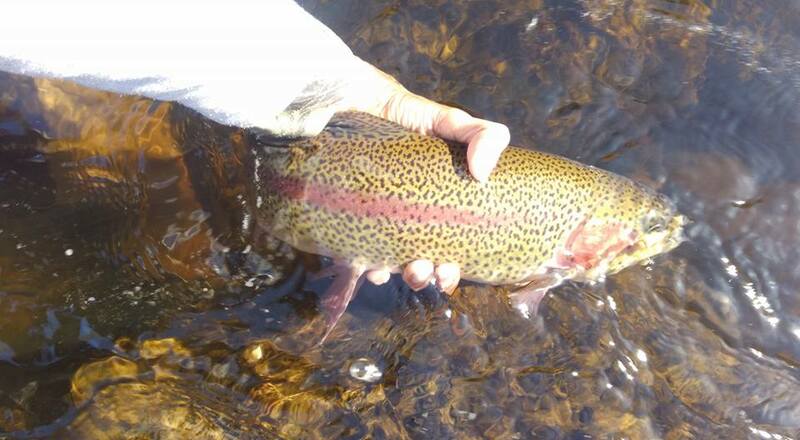 After my 3rd or so cast, I hooked into a nice bow. It ran around the pool and even jumped a couple of times. I was shocked to see how well these fish can fight even in absolutely frigid water and I was afraid I would lose the fish since I was fishing with tiny nymphs. After about 5 minutes, I was able to land this beauty. After landing that fish, I looked at the clock and realized that I had to high tail it back to the car so unfortunately, I could not break down this seam as much as I hoped. Oh well, I wasn't all that upset considering. As I left, I saw some ice chunks break off the shoreline and flow down river which tells me spring is coming despite the weather expected over the next few days. If you go out this time of the year, dress warm and fish with tiny nymphs (size 18-22) deep and slow. We are about two weeks off the start of the stonefly hatch and probably about three weeks off from the first stockings by Fish and Game so better days are coming! If you are itching to fish, Mass Fish and Game has started to stock some ponds as well as the Swift River so give it a go! Thanks for the comment! I look forward to posting in the future. Glad you enjoyed the read!